A bedroom needs a headboard to be complete right? Well, that's not necessarily true. When you consider the advantages of a headboard, it becomes apparent there are a whole lot of alternatives to be explored. A headboard is often used to add extra cushioning, anchor the bed in a visual sense or supply convenient storage or bed lamps. These are all functions of course that can be served by other means. One potential problem is that once you get started on exploring the alternatives, it might be easy to get a little carried away with the more beautiful, decorative or even experimental choices. If this is the case, remember to focus on the primary function of the bedhead. Everyone needs a good night's sleep and your headboard should make your bedroom all the more comfy, beautiful and relaxing. So let's get started by exploring a few exciting alternatives to the classic headboard. Enjoy! This utterly gorgeous feature mirror art makes for a decadent and dreamy bedroom. 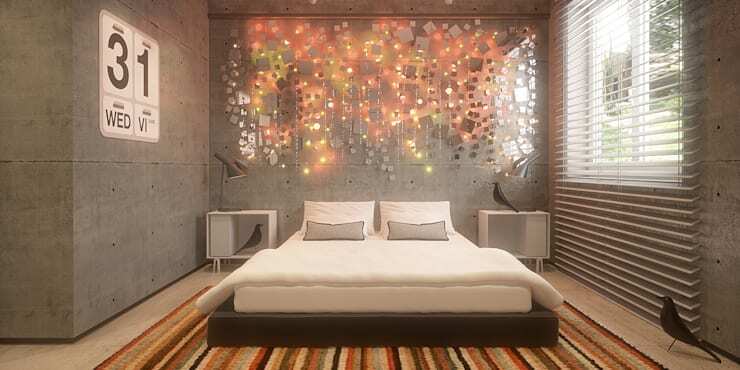 The decision to interweave light beads into the artwork adds a whole other ethereal quality to the bedroom. 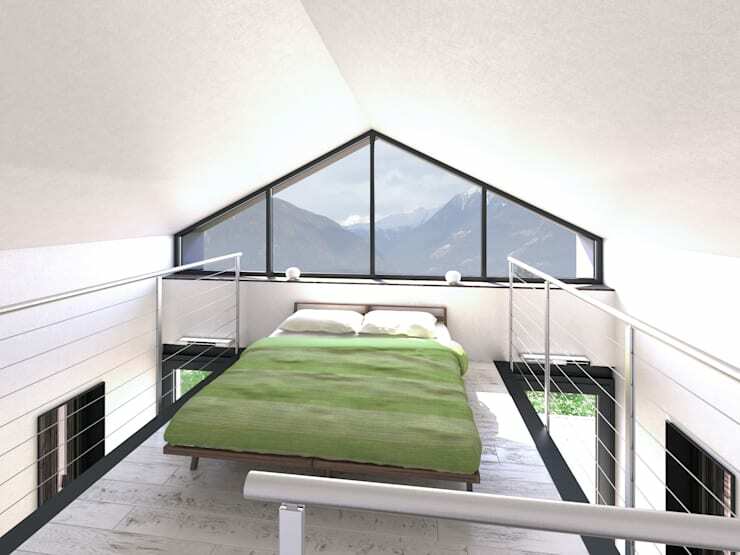 Your bedroom is a place to relax, dream and refresh yourself. No matter what design choices you make, it's important to remember this. 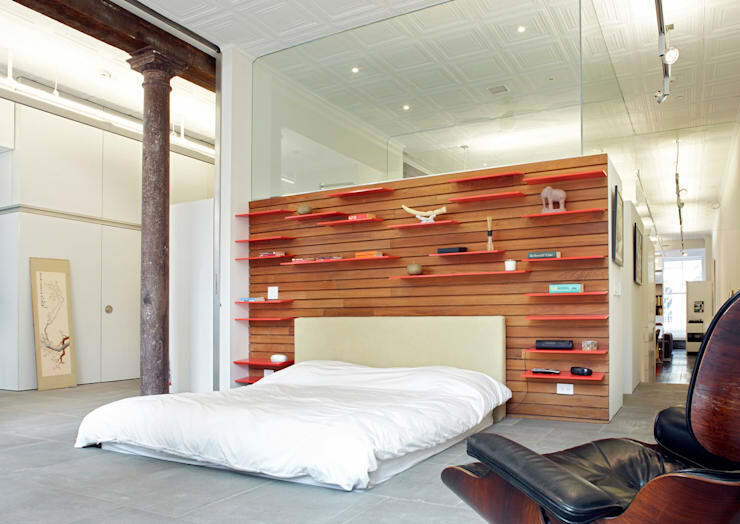 Note that you'll need plenty of good support pillows for cushioning in a room like this. But the payoff is truly spectacular. For many of us, our bedrooms are the perfect place to sink into a book and while away a few hours. Reading can be the perfect way to switch off from the day or just ease into a lazy Sunday morning. This bookcase headboard adds an almost bohemian vibe to the bedroom and wooden finishes and panels are almost always a good addition to a bedroom. In a time when it's increasingly hard to switch off, a bookcase in your bed might be the perfect solution. 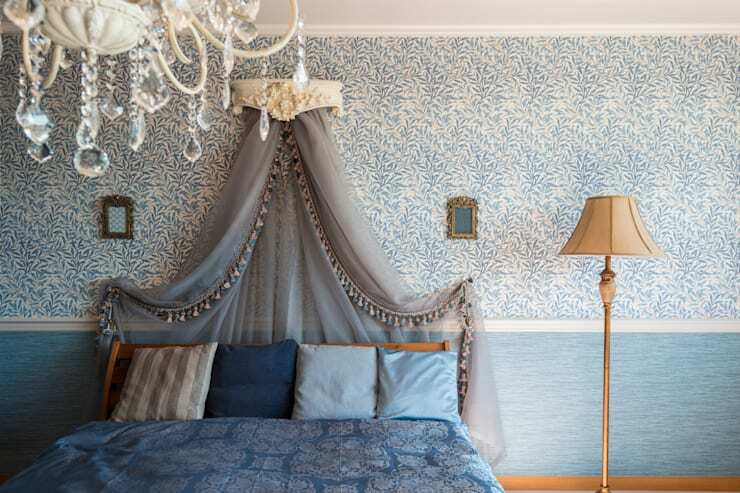 Strictly speaking, this bed has a headboard, but the curtain canopy could work just as well without it. This is a very cheap way to add a whole lot of decadence to the bedroom. Just gather some beautiful material and pin it around the top of the bed. Who knows, it may make you feel like royalty. A few large pieces of abstract art will create a calming atmosphere in the bedroom. It's best to stay away from anything too harsh, figurative or stimulating. 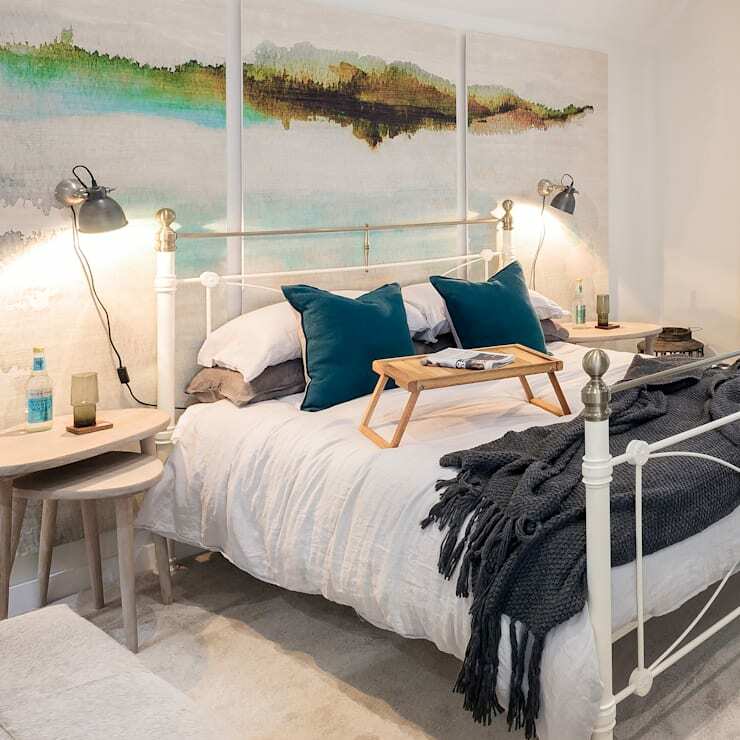 Look at how this artwork adds a calming ambience to this bedroom. As an aside, we love how the side lamps have been attached to the canvas. 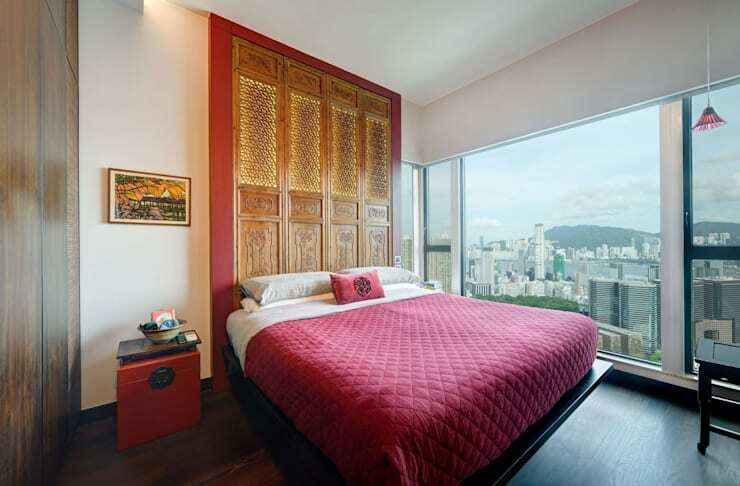 This lovely contemporary bedroom by Hong Kong decorators ample design would be a little bereft of warmth and interest without this beautiful wooden antique screen. The soft textures and decorations in the old wood add a homely touch that's always good to have in a bedroom. If you try something similar and find that it simply looks like an old screen shoved behind your bed, look at adding some ambience strip lights behind the screen like this. It will add a lot more finish to the look and help unify it with the rest of the contemporary elements in the room. For a soft even glow, look at ways to contain the light within perspex. It's important to create some psychological boundaries around your sleeping habits. Boundaries will help you put away the activities of the day and focus on prioritising rest and relaxation. If you are lucky enough to have a lovely bedroom window, it can often be used to anchor the bed in a visual sense that can really help make that mental shift at the end of a long day. The additional benefit is that the window ledge can also be used to store small lamps like this. If you are thinking of redecorating, you'll love this Ideabook Unique ideas for decorating with mirrors.